Costa Rei is the king's coast of Sardinia - here, 8 kilometres of long, bright white sandy beach enchants sun worshippers, families and water sports enthusiasts. The beach is flat and child friendly; crystal-clear water glitters all along this unique gem of a beach. Sant’Elmo lies at the northern end of Cala Sinzias, nestled between broom and juniper. This quieter, beautiful section of the coast features impressive granite and lava rocks, which offer a great alternative to lounging on the beach. At Capo Ferrato, the entire power of Sardinia is palpable: the wild rocky cape is a great place for hiking and calming the soul – and afterwards, its southern side awaits with Spiaggia di Portu Pirastu, an irresistibly tranquil beach perfect for relaxing and snorkelling. Cala Sinzias is a family-friendly, idyllic beach that stretches 3 kilometres along the south-east coast of Sardinia. Its light, fine sand meets the sea on a beautifully flat plain, making it ideal for small children. From areas with lounger hire to quieter corners, everyone will find their perfect spot here. Spiaggia di Feraxi is a beach with light-coloured, fine sand on the east coast of Sardinia. Nestled between an idyllic lagoon and the turquoise sea, its location makes it something very special. Spanning three kilometres, its calm water delights both families with children and those looking for some peace and quiet. On the east coast of Sardinia, Muravera enchants with its extensive beaches: the fine grey sand on Spiaggia di Colostrai, the thin yet endless Spiaggia di San Giovanni and the peace of Spiaggia di Cristolaxedu are guaranteed to get the hearts of all beach fans racing. Torre Salinas is a beach on the south-east coast of Sardinia - perfect for everyone who wants to enjoy a slower pace of life. The long, fine sandy beach stretches for kilometres; birds breed in the former salt pans behind. The perfect beach for families and those in search of peace and quiet. On the south-east tip of Sardinia, Villasimius and its beaches sparkle with Caribbean flair: to the left and right of the sun-drenched protected area of Capo Carbonara, turquoise bays like Cala Giunco, Spiaggia Campulongu and Punta Molentis beach mean visitors are spoilt for choice. The relaxed residential area of Torre delle Stelle is surrounded by several fine sandy beaches. Genn’e Mari, Cann’e Sisa and Spiaggia di Solanas leave nothing to be desired for sun worshippers and families. All beaches offer a good infrastructure. The Villas Resort **** near Castiadas finds its natural cradle in the marvellous and calms south oriental coast of Sardinia. Set among a maquis that smells of ancient tradition, myrtle, juniper and mastic trees, it is reflected directly in a clear and breathtaking sea. The Resort typically offers a Mediterranean, warm and solar architecture, ideal to spend the holiday. It harmonically mixes with the nature that surrounds it, and it will give unforgettable moments to the families, to the couples and the singles. The Sant'Elmo Beach Hotel is situated on the South East coast of Sardinia, only 4 km from Costa Rei and 14 km from Villasimius, in a large open area of typical Mediterranean greenery where charming gardens form an ideal setting for an enjoyable and relaxing holiday. The beautiful four star Cruccuris Resort hotel is situated in Villasimius. This structure is named after the area nearby, “Cruccuris”, where archaeological digs have revealed traces of settlements dating back to the 1st and 2nd centuries AD. Rio Molas Residence - a lovely countryside hotel in the hinterland of Muravera, in the southeast of the beautiful Mediterranean Island of Sardinia.- ideal for relaxing. Villa Tre Mari is a small hotel in Villasimius, a town at the southern tip of Sardinia's east coast. The hotel, owned by the Jesuits and their summer residence, is set in a large garden in between Mediterranean scrub and colourful flowerbeds, on 7 acres of grounds sloping down to the sea; in the middle of the land a small chapel is hidden. Through the garden, a small path leads down to the beach of Campulongu, just about 50 metres. Su Castededdu overlooks the Costa Rei, the King’s Coast, like a small castle - surrounded by evergreen macchia bushes, it has a view of the glorious sandy beach. Only a short path and a narrow road separate the property from the gleaming white beach. Nestled on the hill like bird''s nests, these houses are hidden in the ledges of Costa Rei among shady trees and Sardinian maquis. Houses right on the white sand beach. The spacious, fine sand beaches of the Costa Rei are ideal for swimming and a paradise for children. This recently constructed private villa lies on a pristine sandy beach on the north end of the Costa Rei in the Villagio Rei Sole. Each of the houses in Villagio Rocca S. Elmo has been constructed from pure granite, and is designed to accent the region''s pastoral charm. The Villagio has been the recipient of an international Architecture Award. Li Conchi - magnificent resort with Sardinian soul this extraordinary holiday complex is located on the slopes of the evergreen hills of the Natural Reserve Parco dei Sette Fratelli in the south-east of Sardinia, just 2 km from the beautiful beach of "Cala Sinzias". The "Spiaggia del Riso" houses lie in an enchanting landscape of sandy bays, inlets and curious rock formations and they have a wonderful view of Campulongu bay and the impressive south coast, thanks to their location on a gently sloping hillside. 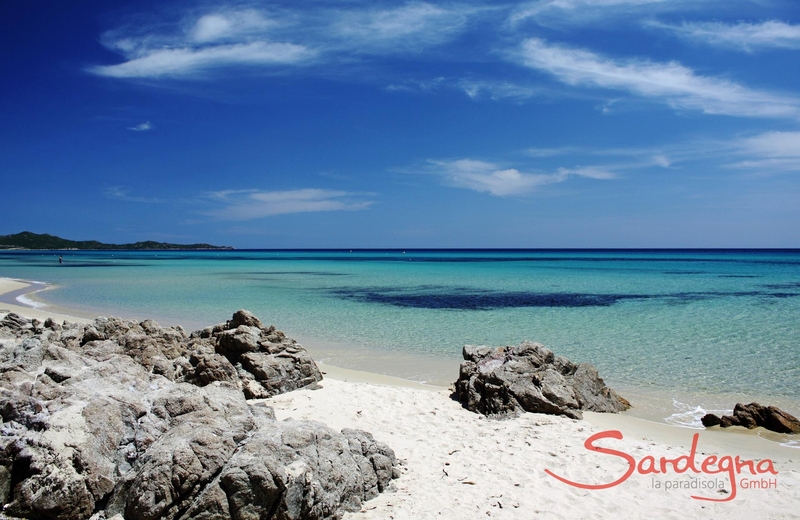 Costa Rei - idyllic beaches and lively ambience in south-east Sardinia. On Costa Rei, beach holidays become an unforgettable experience: the ‘King’s Coast’ stretches from Sant’Elmo to Capo Ferrato, offering never-ending sandy beaches punctuated with small, rocky bays. The tourist resort of Costa Rei unites Mediterranean lifestyle with a wide range of sports activities to guarantee a truly perfect holiday. Sant’Elmo - beautiful beachfront villagio near Costa Rei. Sant’Elmo is a self-contained, small village of exclusive holiday apartments. The award-winning architecture of the homes blends in perfectly with nature - in a car-free zone, directly on the white sandy beach of Sant’Elmo. The ultimate in relaxation! Cala Sinzias is the beach of everyone’s dreams: brilliant white sand, crystal-clear water and rich green unite in an enchanting play of colours. Nestled between Monte Macioni and Sant’Elmo lies a peaceful, untouched area that is still an insider's secret in Sardinia. Torre Salinas - a peaceful village on the beach near Muravera. Torre Salinas is a pretty holiday resort on the south-east coast of Sardinia. The group of holiday villas is located directly on the sea, harmoniously embedded in nature. The expansive, sandy beach offers unadulterated relaxation, the finest bathing pleasure and abundant opportunities for romantic strolls along the seafront. 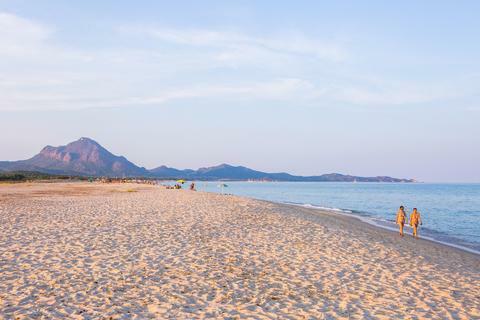 Villasimius - stunning beaches and nightlife in southern Sardinia. Villasimius is a charming fusion of picturesque beaches, hip nightlife and historical culture: the former fishing village on the south-west tip of Sardinia is guaranteed to impress with its bays, chic clubs and typical Sardinian way of life. Muravera - home of lemons and tranquil beaches. Muravera is a small town, picturesquely situated in the fertile foothills of Sarrabus. Renowned all over the island for its aromatic oranges and lemons, Muravera captivates with its idyllic beaches that offer the perfect balance of liveliness and relaxation. The famous Costa Rei is also part of Muravera. 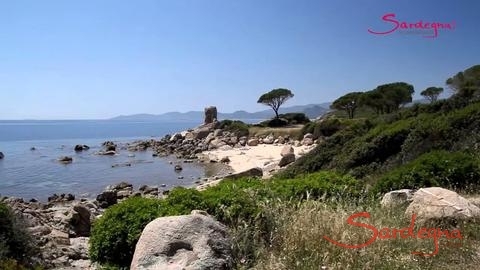 Torre delle Stelle - a relaxed holiday destination in south Sardinia. With its laid-back atmosphere, it’s impossible not to fall in love with Torre delle Stelle. The pretty holiday village in the south of Sardinia was created around 30 years, framed by two stunning, sandy beaches. Translating as ‘Star Tower’, it welcomes celebs and holidaymakers alike. Yummie, self-made ice cream. Gluten-free cones and biscuits. Flowers and plants for special occasions and to take home with you. The carnival parade of Muravera takes place in the first or second week of August. The magical sounds of the Sardinian musical instruments are fascinating, and now and then one of the main characters, the "Iazzi degli Issohadores di Mamoiada" teases the spectators and pulls them into the parade. During the famous Sagra degli Agrumi di Muravera (folk festival in honour of the citrus fruit) in early April, and increasingly spontaneously through the year, there is the opportunity to visit inner courtyards. Residents offer homemade Sardinian specialties and show how they live. Look for notices for the dates in town. The pools of Diverland are located in a green oasis at the foot of the Sette Fratelli mountain range. In addition to the many slides and pools, there is a place with various boutiques where you can stroll and shop in peace. There are also two restaurants: for lunch, you can choose a quick, self-service option, and then later enjoy dinner at the à la carte restaurant. Here you can buy hand-woven carpets. The exhibition space is called Il Telaio di Fanunza and is located at Via Roma 90, the main thoroughfare of Muravera. If you want to watch the carpet weaving then visit the weavery at Laboratorio Tessile Corona, in Via Sarrabus 3. Open only in summer. Behind the Piazza Sardegna. Open daily from 15th May-30th September, including Sundays and public holidays. Beside the church in Solanas. A simple beach bar with a great offer: Bistrot and Coktails. Also a stunning view over the beach of Costa Rei. Peculiarity: there are three parots at the bar who speack itlian and german. Elegant beach bar in the beautiful bay of Cala Monte Turno. Sometimes there are DJ sets and events. This stylish beach bar is open from May to October. Unfortunately, it is not inexpensive. In the evening, you can try their excellent grilled meat and fish, but only with a reservation. A beach bar with cheerful colours that prides itself on its "granita" (finely crushed water ice with fruit syrup) and their healthy breakfast options. At noon and in the evening it offers very tasty light meals and the finest fish from the grill. This delightful little farm produces and sells honey and its by-products. In June and August it is possible to watch the honey production. To find the beekeeper, follow the SP20 in the northward. Do not turn off to Olia Speciosa, rather continue a few kilometres to Tuerra at km 30.5. This is one of three direct sales of the fishermen's cooperative of Feraxi. Among other things, you will find fresh mussels, oysters, sea bass and sea bream and from their own breeding operation. In the summer you can also find the shop on the Costa Rei in Piazza Europa. Small, but good, fish shop on the corner of Via Roma and Via Giuseppe Ungaretti. Since 1950, the fishermen's cooperative of San Giovanni has been working in the areas of Colostrai and San Giovanni. The fishing is sold to the fishmongers of Muravera, Costa Rei and the wholesale trade, as well as the fish market of Cagliari. The catches include eels, gold perch, sea bass, sea clothes, mussels and oysters. Olia Speciosa is a small village not far from the Costa Rei, towards Muravera. There you can buy Sardinian goods cheaper than on the Costa Rei. Next to the beautiful church and the town hall decorated with Sardinian wall paintings, there are some typical shops and restaurants. Catch-fresh fish can be bought in the local pescheria located behind the bank, on the left in front of the town hall. Handmade ravioli and delicious little pastries are available in the pasticceria at the entrance of the village. Everything radiates rural charm inspiring everyone who is looking for the non-touristic, true Sardinia. Another attraction is the Cantina Sociale. There you can buy wine from the barrel cheaply in a "damigiana", a plastic canister that you bring yourself. You can also purchase award winning wines in the local wine boutique of Cantina. Camisa will seduce you with bread specialties from Su Civraxu and, just around the corner, with local pecorino of the Caseificio. In the old Sardinian fishing village Villasimius in the 1060s, Ernst Jünger wrote his book "Am Saracenenturm". The piazza, with its Mediterranean charm, is the centre of village life, where old and young meet in the evening. In July and August there is a small Dorado with lively nightlife. Numerous restaurants, pizzerias and shops complete the leisure offerings. The old fortress from the 17th century can be found in the port, inside which an international art centre now organises exhibitions. Going to Capo Carbonara, you can enjoy a spectacular view of the sea. 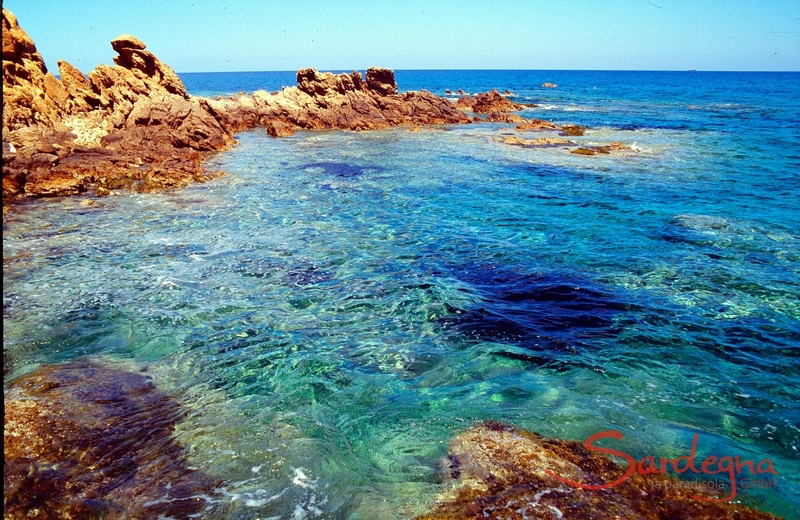 Villasimius is known for its diversity of underwater flora and fauna and has been declared a nature reserve. Between Cagliari and Villasimius, below the 30 kilometre long panoramic road that runs along the south coast, is where the tourist resort of Torre delle Stelle around the Saracen tower Torre de Su Fenugu was built about 30 years ago. On a single hill, south and north of two sandy beaches, are majestic villas where film actors and singers of the rock and pop scene spend their summer holidays. The owners of the restaurants and supermarkets offer homemade Sardinian specialties such as Culurgiones and other varieties of local pasta fresca. Numerous leisure and sports facilities, as well as a diving school provide entertainment. The most beautiful and longest bathing beach in Solanas and the unspoilt coastal section around Geremeas with a beautiful natural sandy beach makes this part of the south coast particularly attractive. A Cantina Sociale corresponds to a cooperative, and is one of the traditional forms of wine production in Sardinia. A visit is worthwhile to taste the wine varieties produced here, such as the Cannonau (red) or Vermentino (white). The wine from Castiadas is now exported all over Europe. If you like the wine, you can buy it directly at the Cantina Sociale. We recommend the inexpensive and original five-litre bag in a wooden box that costs about 10 euros. The myrtle liquor and Grappa of Sa Bresca Dorada are gaining popularity beyond Sardinian borders. If you wish to buy directly from the producer, leave S. Elmo/Costa Rei and drive in the direction of S. Priamo/Muravera. A sign bearing the inscription "Bresca Dorada" leads you directly to the point of sale below the Monte Liuru. The Costa Rei beach is about 8 km long and is characterized by its fine white to yellow sand and crystalline water. Worth mentioning is the characteristic granite rock Scoglio di Peppino. The Costa Rei beach was voted the fifth most beautiful in the world in the Lonely Planet. A lovely section of beach in front of a resort with the same name is composed of rock formations and small sandy bays. It is protected by the Monte Turno hill to the south, which gives its name to the next section of beach. Small bay framed by flat rocks at the northern end of Costa Rei. Grey sand and pebble beach, less suitable for children. A pine forest behind the beach offers shade from the midday sun. Capo Ferrato lies secluded and almost isolated on the north end of Costa Rei. It offers superb little bays for those seeking privacy. As they are a little rocky, these beaches are less suitable for children. On the north end of the cape lie the natural pools of Feraxi and Colostrai, home to typical marsh wildlife. Cala Sinzias is situated between Villasimius and Costa Rei. Framed by high mountains, gnarled trees and macchia which reaches as far as the beach. The heavenly water has been recognized by the Goletta Verde as the cleanest of the Mediterranean Sea. Outside the high season, the bay is an oasis of silence. In the summer there are the beach bars Tamatete and Maklas (see Beach Bars). Feraxi beach in Muravera is a nice, 3 km long sandy beach away from the masses. The sea is easily accessible and the water is crystal clear. The dunes are covered with typical vegetation. There is parking, a kiosk and a beach bar. The beach is good for snorkelling, as the clear water is rich in fish. Small bathing bay close to the road that goes from Costa Rei to Villasimius (SP 18) at about km 11, opposite the island of Serpentara. The sand is white and the water shallow. Small, splendid bathing bay with water as clear as glass and a dazzling white sand beach. Take the coastal road from Costa Rei to Villasimius. After about 16 km, in the middle of a left turn, turn right on a gravel road and go under the road. After another 1.3 km you reach the beach. This narrow sand beach has fine sand and is located opposite the yacht harbour. It is a famous surfing spot, and the sun sets in the west making for fantastic sunsets. Beautiful, broad, sandy beach with deep water just before the town of Villasimius if you are coming from Cagliari. The Cala Giunco beach is one of the most beautiful beaches in Sardinia: crystal-clear water and white Caribbean-like sand. Drive towards the harbour and turn left. When you see the lake, keep slightly to the right. The Solanas's town beach is just about 1 km long and offers white sand and shallow water. As it is practically attached to the town, you can find bars and sport equipment for rent right on the beach. These two beaches belong to the holiday resort Torre delle Stelle. Genn'e Mari offers white sand and a gradually sloping seabed - ideal for swimming. Cann'e Sisa has cream-coloured sand and offers bars and many sports facilities. Beautiful white sandy beach, about 3 km long, right in front of Geremeas. Well equipped. The crystalline water shimmers with beautiful colours over a seabed of pebbles. The end of Geremeas beach is called Kala'e Moru. It is just in front of the settlement with the same name. Parking just behind the beach. This fantastic beach is located directly on the coast road SP 17 to Cagliari. Mari Pintau gets its name "painted sea" because of the spectacularly intense turquoise and blue colours of the sea water next to the almost white sand and pebble beach. Just park the car on the edge of the street and walk down a few hundred metres to the beach. Scalas and Cuile Piras, the Nuragic holy places of worship were established around 3,000 BC close to Piscina Rei, not far behind the lagoon. The 43 menhirs (1-2 metres high and 50-70 cm wide stones set into the ground) are arranged in small groups of roughly 3 to 4 menhirs. It is assumed by the layout of the menhirs that the site was used for astronomical observations relating to the solstice or lunar cycles. The S’Omu e S’Orcu nuraghe can be found near Santa Giusta, inside the borders of Castiadas district. Due to its complex construction, it is one of the most important nuraghe on the island. Nuraghi are tower-shaped structures made of stone, built more than 3,000 years ago. Up until now, more than 7,000 such towers have been discovered all over Sardinia. One of the best-known nuraghe is Su Nuraxi, near Barumini. The S’Omu e S’Orcu nuraghe can be found near Santa Giusta, inside the borders of Castiadas district. Due to its complex construction, it is one of the most important nuraghi on the island. Nuraghi are tower-shaped structures made of stone, built more than 3,000 years ago. Up until now, more than 7,000 such towers have been discovered, all over Sardinia. One of the best-known nuraghi is Su Nuraxi, near Barumini. In the nearby mountains of the Sarrabus you will find a change from the beach. Here you will find many hiking trails around the seven peaks of the granite massif, the highest being the Punta Sa Ceraxa, which rises 1016 metres above stone forests and mastic trees. Always keep an adequate water reserve with you in the summer. The entrance to the nature reserve is on the road to Cagliari, near the turnoff to the village of Burcei. For guided hikes, please contact the Cooperative Monte dei Sette Fratelli (see Excursions). 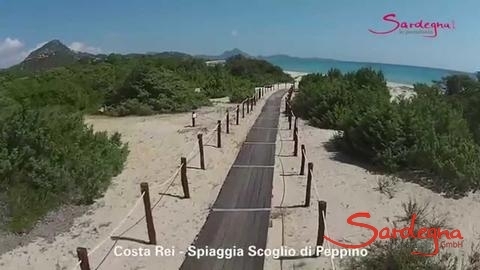 The marine reserve "Area Marina Protetta di Capo Carbonara" has been running round the "Capo Carbonara" at Villasimius since 1998. This section of the sea between Capo Boi in the west and the Isola di Serpentara in the east, is a snorkel and nature paradise. Apart from many species of fish, visitors can also observe a large number of rare waterbirds. The fortress is situated on a cape close to Capo Carbonara at the eastern end of Cagliari Gulf. It is a complex structure, originally built as a defence post against barbarous incursions. It is a defensive structure that was supposed to protect the people against the raids of the barbarians and whose first part was probably built during the Aragonese period. During the Spanish era the building was then integrated into a structure with four towers. The old defence tower has been drawing attention in the last view years because of a very special exhibition: old documents and photos from the history of piracy are displayed here. Delicious homemade Sardinian specialties. Mainly baked goods, but also other items on offer. Beautifully decorated. The pastry shop Marci produces traditional, well crafted Sardinian pastries as well as all kinds of cakes. Individual tarts can be ordered for private parties and weddings. This pizzeria is situated directly in the holiday resort of Sant'Elmo. It also serves salads and steaks, or you can simply visit the bar. It is open from May to September. Typical Sardinian wines and food. It is a good meeting place for an aperitif; you can try everything before buying it. Snack bar and restaurant right in the harbour of Villaputzu by the beach with outdoor seating - the perfect place to have breakfast in the morning overlooking the sea or to meet friends for a drink. There is also a beach volleyball court very close by. Take the main road Via Ichnusa to the north end of Costa Rei. Iba Sa Cresia lies about 200 metres before the campground Le Dune, on the left hand side. They offer excursions with quads and on horseback. Every Thursday and Saturday from June to September. You will find the market near the blue church in front of the newspaper stand. Open Saturdays all year round. Open Mondays all year round. This cooperative organises off-road vehicle excursions, bird watching and guided hikes in the impressive mountain chain between Costa Rei and Cagliari, the Sette Fratelli. Excursions for singles and groups in the whole of Sardinia and particularly on the south-east coast and in the Sette Fratelli park. The offerings range from 4x4 tours, hiking, trekking and Nordic Walking to boat excursions. In Muravera, the general medical emergency service is located directly in the San Marcellino hospital. Traditional cuisine in a Sardinian style environment. In summer you can eat outside under the porch while the kids can play in the playground. The owners create a warm and welcoming ambience and the kitchen offers dishes like homemade ravioli, baked vegetables, panadas, culurgionis with tomato, handmade malloreddus, among the desserts pardulas and seadas. Here you can also try the typical roasted suckling pig and grilled lamb. This family run business is situated in a vineyard with an olive grove, peach trees and tomatoes growing in greenhouses. The quality of the produce is guaranteed. With their fresh products and local specialties, the owners prepare delicious Sardinian dishes with a warm and welcoming ambience. Great riding and sports centre (see Activities). The restaurant located on the premises offers all sorts of goodies for gourmets. The centre is located near San Priamo, just follow the road that leads out of the city and runs along the river Rio Picocca in the direction of the lagoon Colostrai. The holiday village Free Beach Club also has tennis courts. It is located just beside the supermarket Delfino in Sant'Elmo. Campground with tennis courts and mini golf located at the north end of Costa Rei. Four tennis courts belonging to the hotel. To book, please call a day in advance. For tennis court reservation in the Torre delle Stelle grounds, please contact the caretaker. There are tennis courts in the Geremeas grounds between Geremeas and the Van Gogh restaurant. If you drive south on the SP17, you will see the tennis courts at km 19 at the edge of the road. They are part of the country club, but are available to the public by reservation and for a fee. This centre can be easily found taking a stroll along the beach. It is located between the Hotel Costa Rei and the Free Beach Club. It offers water sports, including sailing and motorboat hire, with a skipper. It also offers full- or half-day boat trips for up to twelve people. For rentals of one week, a maximum of six passengers are allowed. Reservations can be made directly at the beach or by telephone. They operate from the beginning of June. Situated on the beach of Piscina Rei, also offers boat excursions. Boat storage facilities, boat hire and guided excursions by rubber boat. The Lido Tamatete also offers motorboat rental, excursions with a skipper and diving excursions at the beach bar in Cala Sinzias. The Delfino Club offers rubber dinghy rental, boat excursions and pedal boats at the Cala Giunco beach. Sailing boats or motor yachts (with or without skipper) can be chartered in the new marina of Villasimius. Group boat trips on the 22-meter-long sailboat Matilda II built according to the historical model. Maximum of 60 people. Daniele, the ship's builder and captain, takes you to the Isola die Cavoli, where a short guide to the lighthouse is possible. A Sardinian lunch is prepared on the ship and is included. Located on the Molo S boat dock, Maby Mare offers group boat trips with the Veliero Maby II. A day trip including lunch on board is possible for a price of 80 euros per person. Departure a 10:30, return 17:00 hrs. Offers boat trips and boat service. In addition to delicious pizza, this restaurant in Rei Marina offers first-class seafood appetizers. It is situated about 50 metres from the main Via Ichnusa road. A Swiss-owned restaurant that has been located in a fishing village on the Costa Rei for decades. On the terrace with a Mediterranean flair, you can enjoy the first-class food in an upscale price category. This restaurant is mentioned in the Michelin guide of restaurants and offers excellent regional and fish cuisine. All pasta dishes can be prepared gluten free if asked for. There is a pizzeria directly in front of the S. Elmo holiday resort, beside the supermarket. It also serves salads and steaks, or you can just go there for a drink. It is opened in the summer from May-September. Here you can enjoy a very good pizza at a good price. The place is a bit off the beaten track. A large restaurant with a barbecue and patio. Traditional dishes such as Porcheddu (suckling pig) are served here, but the speciality is fish dishes. In this simply furnished restaurant there are plenty of fish dishes from their own catch. From a dining room and the terrace, you have a lovely view of the lagoon. Restaurant with a pleasant atmosphere and good service. Also pizzeria. This restaurant/pizzeria specializing in fish dishes is situated directly by the wetland area of Torre Salinas and is run by Luciano Schirru. The bright dining room and the beautiful garden offer a welcoming ambience. Here you can enjoy typical Sardinian cuisine and fish specialities, based on the freshest of products. This simple restaurant with black-and-white tiled flooring and wood panelled walls offers good pizza, seafood and homemade desserts. The service is good and very friendly. This restaurant lies directly in the centre of the lively town of Villasimius. The delicious cuisine ranges from fish dishes to pizza. The restaurant boasts a sea view and is located directly on the beach. The outdoor tables are protected against the weather by a glass veranda. There you can eat tasty, typical Italian dishes at reasonable prices. The restaurant is located on the beach of San Giovanni and is accessible via SS 125, about 3 km from Muravera towards San Priamo. Follow the signs to the restaurant. The restaurant is open from March to October. It offers small tables right on the sandy beach, and you can even eat a little something there after midnight. It is located on the provincial road 17 in the direction of Villasimius, shortly after the Villaggio Mandorli resort. The restaurant bar of our former employee, Giancarlo Dessì, offers fresh fish and meat dishes with regional ingredients. On request he prepares the typical Sardinian suckling pig dish. You can request a catering service for your house or for special events as well. Known as a top restaurant that serves typical Sardinian specialities, this restaurant has a lot of regular guests from Cagliari. To be sure to find a free table, we suggest you to make a reservation. Situated on the SP17 in Solanas, between Cagliari and Villasimius, close to the petrol station. Restaurant and pizzeria, also to take away. You will find this restaurant at the second entrance of Torre delle Stelle, when you drive along the SP17 from Geremeas towards Torre delle Stelle. First class fish restaurant featuring specialities from the Sárrabus region. Very good restaurant with excellent seafood. There is an extensive menu, which costs round 35 euros. Diners sit on a beautiful terrace overlooking the sea. The mini golf area is part of Sant'Elmo's sport facilities and is open from the beginning of May from afternoon to evening. In the immediate vicinity there is also a kiosk and supermarket. It is located on the main road that leads past Villaggio Sant'Elmo, at Sant'Elmo Beach Hotel 4*. The 18-hole golf course offers a view of the Capo Carbonara. Be sure to reserve a tee time at least one day in advance. This market sells Sardinian souvenirs in addition to groceries. The GTRE market can be found in the Piazzetta Piscina Rei, in the part of Costa Rei called Piscina Rei. Closed in the low season. For large shopping needs, we suggest driving to Muravera. Close to the entrance of the town of Costa Rei, in Via Colombo Nr. 1 lies Monte Nai market. In addition to groceries, you can buy everything for the beach: beach umbrellas, beach mats, sunscreen, etc. Here there is a butcher, a fish market as well as fresh fruits and vegetables. Gas bottles can also be obtained here. The supermarket is located in the central Via Colombo in Costa Rei. Closed in the low season. This small shopping centre is located directly in Sant'Elmo, close to the Sant'Elmo Beach Hotel. It has a magazine shop, as well as a meat shop and a fish store that sell fresh meat and fish every day. Closed in the low season. This inexpensive supermarket has a good selection. Open all year round, daily from 8:30-21:00. Inexpensive supermarket with good products. Homemade ravioli, typical bread "Marteddu" and Dolci Sardi. Small supermarket easily reached by the guests in Torre delle Stelle. It is closed in the low season. Can be found on the Piscina Rei Beach. Boat excursions are also offered. Delfino Club offers the opportunity to practice wakeboarding, waterskiing or windsurfing. Boats can be hired to enjoy a few beautiful hours on the sea. This centre offers lessons and riding excursions for beginner and advanced riders. The "Centro Immersioni Sardegna (CIS)" organises guided dives with your own or borrowed equipment, day or night. Underwater videos can also be filmed. Upon request youth and children can also participate. The centre is located in Via delle Agavi in Costa Rei. The diving excursions leave from the beach between the campground Le Dune Cooreyturs and the Hotel Vera Club, Turagri. This school has been based in Villasimius since 1998. Bolla Blu Diving offers diving lessons with qualified trainers. Theoretical lessons are also taught using audio-visual media. They provide all of the equipment and teaching material. Base camp is at the Hotel Residence Cormoran. You will find Manni Schwarz's diving school in the bay of Torre delle Stelle. They specialise in abandoned wrecks. They also offer children's courses from the age of 10. Diving school between Villasimius and Calgliari led by Angie and Marco from Switzerland. Languages: German, Italian, English, French and Spanish. The Porto Corallo bay, located near Porto Tramatzu, is a gem of the coastal region of Villaputzu. There are two beach bars on the cliffs of the bay that offer the best evening entertainment. At the port, there are 430 moorings and a campground that offers many services. To get there, follow the signposting along the SS 125 following the intersection to Villaputzu. At the highest point of the ‘Sa Perda Niedda’, Villa Gioia makes part of a small group of villas next to two majestic cliffs, which are regarded as a symbol of the Costa Rei, with hiding-places in natural caves that are favourite retreats for adults and children alike. The distance to the sandy beach is only 1,2km and it can be reached in five minutes by car. The apartment Gioia Giardino is situated in the basement of Villa Gioia and can be reached by a staircase. In the garden there is a barbecue next to the terrace and an idyllic herb garden. From there you have a great view of the sea. The appartement has two bedrooms, one bathroom, a living-room with kitchen and a terrace with garden. The kitchens, which forms part of the living-room, has a 240 litre capacity fridge, gas hob, washing-machine and dishwasher. A dining table is available on the terrace. Furthermore the appartment offers air condition and heater, a cosy fireplace as well as Sat-TV. Enjoy the video of the Apartment Gioia Giardino as well as <?xml:namespace prefix = "o" ns = "urn:schemas-microsoft-com:office:office" />the virtual tour "1 day at Costa Rei". can be reached in a few minutes by car. The typical weekly market is especially attractive, with its Sardinian handicrafts, local specialities and fresh fruit and vegetables. Villa Gioia - a lofty holiday home above the seaAt the highest point of the ‘Sa Perda Niedda’, Villa Gioia makes part of a small group of villas next to two majestic cliffs, which are regarded as a symbol of the Costa Rei, with hiding-places in natural caves that are favourite retreats for adults and children alike. The distance to the sandy beach is only 1,2km and it can be reached in five minutes by car.A mediterranean garden and terraceThe apartment Gioia Giardino is situated in the basement of Villa Gioia and can be reached by a staircase. In the garden there is a barbecue next to the terrace and an idyllic herb garden. From there you have a great view of the sea. The appartement has two bedrooms, one bathroom, a living-room with kitchen and a terrace with garden. The kitchens, which forms part of the living-room, has a 240 litre capacity fridge, gas hob, washing-machine and dishwasher. A dining table is available on the terrace. Furthermore the appartment offers air condition and heater, a cosy fireplace as well as Sat-TV.Enjoy the video of the Apartment Gioia Giardino as well as the virtual tour "1 day at Costa Rei".Shops, restaurants and pizzeriascan be reached in a few minutes by car. The typical weekly market is especially attractive, with its Sardinian handicrafts, local specialities and fresh fruit and vegetables. Castededdu 1 is perched like a small castle over the breathtakingly beautiful Costa Rei. Castello Numero Uno, a bright and airy apartment, has a rooftop terrace with panoramic view over the sea and the mountains. The fine-grained, sandy beach is just under 300 metres away. Book now! Castededdu 2 is perched like a small castle over the breathtakingly beautiful Costa Rei. Castello 2 is a spacious apartment with two large terraces offering a magnificent view over the southern Sardinian landscape. The fine-grained, sandy beach is just under 300 metres away. Book now! Castededdu 4 is located on the stunning Costa Rei. The Mediterranean apartment is nestled in a south-facing position on the mountain; from the covered terrace you overlook the surrounding hills. And the Caribbean-like beach is only 300 metres away. Book now! Villa Lentischio is the perfect retreat for families: the enchanting detached house is perched on a gentle hillside and has an airy covered terrace and a large, shady garden. The bright, gently sloping beach of the Costa Rei is in front of the garden door. Experience Sardinia together now! Castededdu 7 is perched like a small castle over the breathtakingly beautiful Costa Rei. The spacious terrace apartment's sweeping sea view to the Capo Ferrato is magnificent - and the Caribbean-like beach is just under 300 metres' walk. Book now! Castededdu 8 is located above Sardinia's breathtakingly beautiful Costa Rei. The charming garden apartment has a covered terrace, and the view wanders far over the sea. The stunning fine-grained, sandy beach is just under 300 metres away. Book now and dream! The Castededdu is perched like a small castle over the breathtakingly beautiful Costa Rei. The Mediterranean terrace apartment Castededdu 6's sweeping sea view is magnificent. Walk 300 metres, cross the road and you are already on the Caribbean-like beach with crystal-clear water. Book now! The Castededdu 9 towers like a castle over the breathtakingly beautiful Costa Rei. The charming garden apartment Castello 3 is surrounded by fragrant macchia and olive trees. From the covered terrace you can look far over the sea. And the Caribbean-like beach is only 300 metres away. Book now! Castededdu 10 is located on the breathtakingly beautiful Costa Rei. The small souterrain apartment is surrounded by macchia - and its covered terrace makes outdoor life a real pleasure. The Caribbean-like beach is only 300 metres away. Book now! Castededdu 3 towers like a small castle over Sardinia's breathtakingly beautiful Costa Rei. Nestled in the macchia, the apartment Castello Tre is situated on a gentle hillside. From the large terrace you can look far over the sea to the Capo Ferrato. And a stunning beach is just under 300 metres away. Book now! Villa Alessia is located on a hill above the Costa Rei. The detached house with airy terrace and barbecue has a beautiful garden with mature trees. The nearly flat, stunning turquoise-blue beach, to which you need cross only one street, is especially inspiring to families with children. Book now! Villa Monica is perched on a hill overlooking the Costa Rei. The detached house is situated in a beautiful private garden with old trees. The airy covered terrace has a barbecue and is in close proximity to a beach with shallow, turquoise-blue water, which will thrill families with children especially. Book now! The Castededdu 5 towers like a small castle over the breathtakingly beautiful Costa Rei. The highlight of the bright apartment is the roof terrace, from which you have a breath-taking view over the sea and mountains. And the Caribbean-like beach is only 300 metres away. Book now! Villa Maistu is the perfect place for a relaxed beach holiday. The cosy, detached cottage has a small garden for balmy summer nights and a covered terrace with a barbecue. The highlight: it is only a few steps to a heavenly gently sloping beach. Book now and exhale! Villa Giacomo: spacious appointments and ambience directly on the sea. A few steps through the garden, past the Hibiscus flowers in full bloom, and you will reach the sea. The extensive fine-grained beaches of Costa Rei are ideal for swimming and a paradise. In the Villa Giangaleazzo you can enjoy a fantastic beach holiday a cut above the rest: the spacious house is located only 150 metres from the gently sloping, fine-grained Costa Rei beach. The path to the beach leads past the neighbouring houses and flowering oleander. Book now! Villa Carla is a spacious holiday home with plenty of room for family and friends. The garden's mature trees offer shade, and the cosy terrace provides plenty of space for relaxation. Only a few steps lead you to the stunning, gently sloping beach and the turquoise-blue water. Book now! Villa Palme is a dream country house: This exclusive vacation residence is situated in a 1 km2 secluded palm garden with Monte Nai high in the background. A path leads through a fragrant sea of flowers to the beach of Costa Rei with its fine sand. Nothing could be more relaxing - book now! Villa Rosamar - Beach villa in the heart of Costa Rei Only a stroll along a small path amidst green trees and you are on the legendary beach of Costa Rei: over 7 km of fine, practically white sand, which slopes slowly in the turquoise water. Villa Chiara is a detached beach house with a beautiful garden full of old trees and fragrant shrubs. It is located on Bobo Beach, a sought-after stretch of beach on the Costa Rei. The spectacular, fine-grained beach with turquoise blue water is only a few steps away. Book now and immerse yourself! Villa Romana is within walking distance to the beach, ideal for you and your children. You can completely relax on the large terrace or in the well-tended garden with mature trees. And the gently sloping, find-grained beach with turquoise-blue water is only 100 metres away. Let your dream begin! Villa Leonilde is a comfortable holiday home in Via della Palme, one of Costa Rei's most beautiful locations. Through a large garden with fragrant mirto shrubs, you can directly reach the gently sloping beach and the turquoise-blue water. Book now and enjoy Sardinia! Villa La Viola is the private home of an artist, designed in detail and with a large garden full of fragrant jasmine. 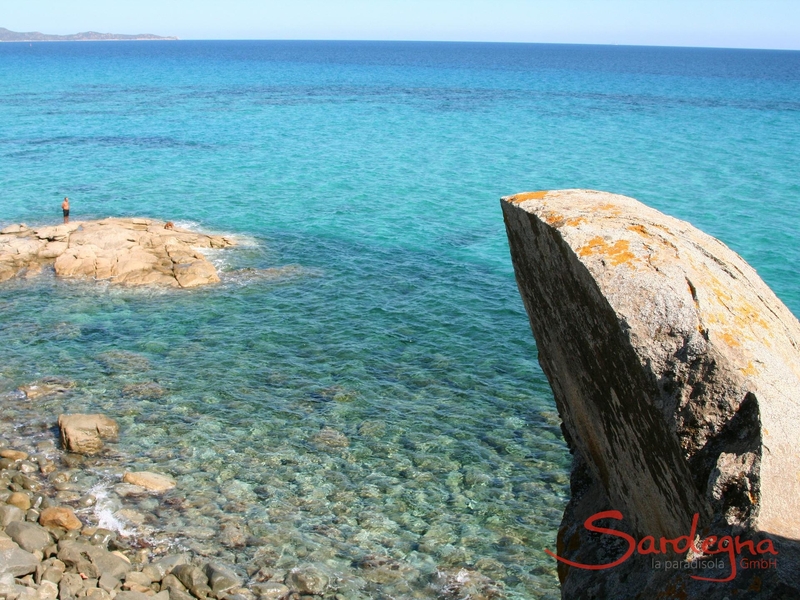 Right outside the door is one of the most beautiful beaches in southern Sardinia, which has an excellent snorkelling area under the rocks. Book your own personal break now! Villa Bua is a real gem: in this stylish villa, you can enjoy life on the colonial-style covered terrace. The well-kept private garden leads to the legendary Costa Rei: the turquoise blue, gently sloping sea is a real beach dream—even for children. Book now! From Nido Capo Ferrato, which means bird's nest in Italian, the view sweeps over the Costa Rei beach to the sea up to the Capo Ferrato. You can not get enough of the play of colours in the water. In the shade of the pine trees, it is pleasantly cool and a light breeze is always blowing. Book a nest! Villa Ibiscus enjoys a privileged location right on the coast. Just a few steps down a little path will take you to a heavenly, 7km long beach. From Nido Costa Rei, which means bird's nest in Italian, the view sweeps over the Costa Rei beach to the sea. You can not get enough of the play of colours in the water. In the shade of the pine trees, it is pleasantly cool and a light breeze is always blowing. Book a nest! From Nido Serpentara, which means bird's nest in Italian, the view sweeps over the Costa Rei beach to the sea up to the island of Serpentara. You cannot get enough of the play of colours in the water. In the shade of the pine trees, it is pleasantly cool and a light breeze is always blowing. Book a nest! Nido Roccia is like a small nest in the rock, surrounded by Sardinian macchia. Young couples can find a romantic retreat here in the form of a living cave. From the terrace, the view sweeps far over the glittering sea and the idyllic beach nearby. Let your dream begin. Villetta 12 makes the relaxing beach holiday dream come true: the oleander blooms in the garden of this lovely semi-detached house - and only a few metres farther, the Costa Rei offers fine sand and turquoise-blue, shallow water. Two offshore rocks invite you to snorkel. Book now! Villa delle Agave is the ideal holiday home for those who wish to spend their holidays in a garden that beguiles all the senses or wish to bathe in a sea with a Caribbean flair. The gently sloping sandy beach with crystal-clear water is only a few steps from the terrace. Book now and enjoy! Villa Graziano is a modern and airy beach house rebuilt in 2017 with a glass-fronted, open kitchen and a small roof terrace that invites you to enjoy a relaxing sundowner. The sensational fine-grained, gently sloping beach is right on your doorstep - it's also perfect for snorkelling! Book now! Villa Costa Rei Mare is a beach house with welcoming architecture and a unique location: a path through evergreen macchia, which still belongs to the garden, leads directly to the fine-grained sandy Costa Rei beach. The gently sloping beach with its crystal-clear water is particularly suitable for children. Pretty holiday home on the bright, wide beach of Costa Rei. Villetta Costa Rei Sole leaves nothing to be desired: a wonderfully uncomplicated beach house with inviting architecture in a unique location. A path through evergreen macchia, which still belongs to the garden, leads directly to the fine-grained sandy beach of the Costa Rei. The gently sloping beach with its crystal-clear water is particularly suitable for children. Villa Nautilus is a spacious, exclusive holiday home on the magical Costa Rei bay. 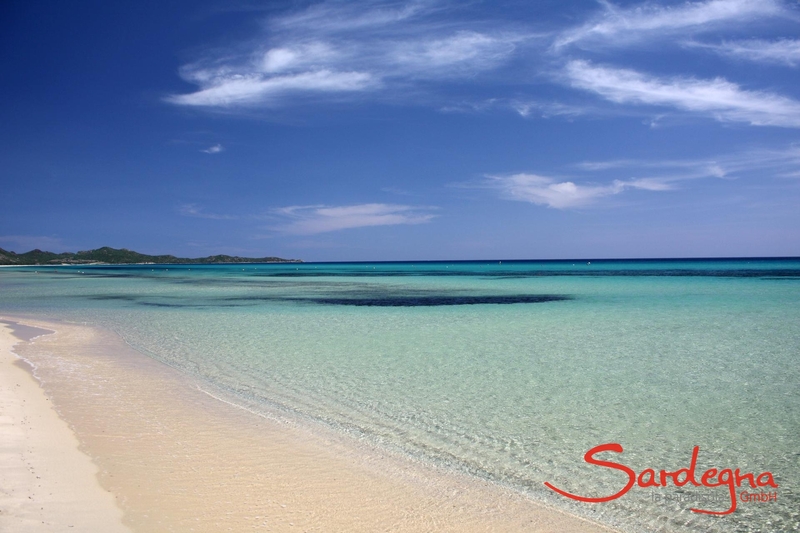 The sandy beach, which lies directly in front of the property, is one of the most beautiful in southern Sardinia. All that separates you from the beach is a 2000-square-metre park - and a garden gate. Treat yourself to something special! Villa Elisa lies on the foot of the mountain "Monte Nai" just a stroll from the beautiful beach of Costa Rei. At the Villa Serena you live right on the beach: a natural garden grows around the spacious, detached cottage - perfect for a relaxing break. The garden leads directly into the turquoise-blue water: the spectacular gently sloping beach is only a few steps away. Book now! Villa Valentino top first row location right on the caribbean like dream beach. A stylish, single standing villa in an elevated position above Costa Rei, which is only about 430 yards to the caribbean like beach. From the rooftop terrace of Villa Nicola you can see the sea of the beautiful beach of Costa Rei, which is just a stroll away. Villa Vela is a detached summer house for families who would like to enjoy a perfect beach holiday together. From the garden with shady trees and a cosy terrace, it is only a few minutes' walk to the stunning, gently sloping beach - perfect for children. Book now! Villa Gioconda is a modern holiday home over 100 sqm. The Sardinian-style villa has a patio and a well-kept garden and is just 300 meters from one of the most beautiful beaches in Sardinia. You reach the turquoise-blue water by walking down a natural path through wild scrubs. Book now! Villa Tiziana is a sunny holiday home in one of the most beautiful areas of Sardinia: the Costa Rei. A blooming garden frames the comfortable villa, and through the bushes, only 300 metres away, stretches a spectacular beach with turquoise-blue water. Book now and relax! Villa Zoello is a holiday villa for beach lovers: the beautiful house has a sheltered garden full of fragrant shrubs, aromatic herbs and a date palm. A few steps through the scrub and your feet touch the sand of one of the most spectacular beaches in Sardinia. Book now! Villetta Daniele is a Sardinian dream: this beautiful holiday home with a lovely roof terrace, a large loggia, and a sheltered patio on the garden terrace leaves nothing to be desired. And the dazzling white sandy beach of Costa Rei is just minutes away. Book now!